The intensification of humankind’s exploitation of nature and society leads us closer to becoming one of the most popular monsters of horror today: the zombie. Zombies heed their internal drives for consumption without restraint. They are the perfect utility maximiser: atomised and dehumanised subjects that consume without thought. Yet the zombie of today is no longer undead – they have evolved. And their evolution is inextricably tied to the changing forms of global capitalism. Today, they have become the so-called ‘quick zombie’ that shadows the late stage of predatory capitalism: the ubiquitous pursuit of profit to the point that it consumes the system’s own basis of reproduction, the world itself. 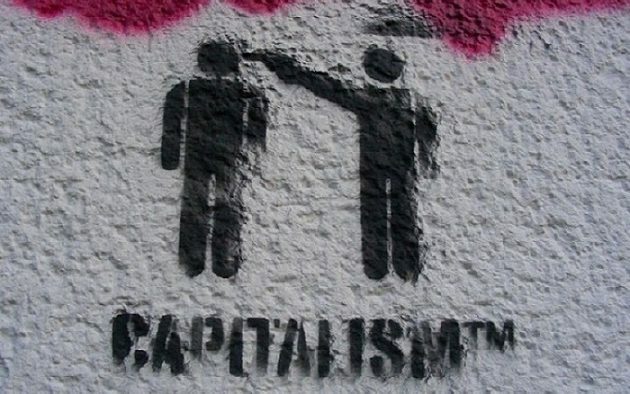 Predatory capitalism is marked by the pauperisation of the very consumers it needs to satisfy its incessant drive for profit; how it ruptures the social fabric of the entire world; and how it pillages the natural environment necessary to sustain itself. This represents an acute crisis of global capitalism where its only option is to devour itself in some orgiastic war of all against all. This is not just localised. It is a global process of predation. The zombie performs a radical function in our thinking by exposing – albeit hyperbolically – the very real limits of contemporary capitalism. They express the fear of the inevitable mastery of consumption over us; the eating away of our social and environmental worlds. In Popular Culture and Geopolitics we have traced this evolution of the zombie across the history of film and discovered that this evolution follows a distinct arc: each phase of zombie evolution reflects our temporal fears of economic exploitation from slavery, to consumption, and now predation in the market. The original Haitian zombie was no villain, but rather a victim of the most pitiable form of exploitation imaginable: slavery from beyond the grave. They remained under the control of powers known only to Bokors or Houngans, the willing agents of slavery. A duppy or zombie is forced to undertake specific commands, typically slave-labour or to harm someone else (send a mort). Though the etymology is difficult to trace, the connection to the contemporary meaning of ‘being duped’ is clear, particularly of being cheated or manipulated under someone else’s will. How zombies of Haitian Voodoo were depicted in early film was, of course, highly disaggregated from the colonial experience: the story had been appropriated and bastardised for Western audiences. The first zombie movies, like White Zombie (1932) and Revolt of the Zombies (1936), followed narrative patterns centered on the labouring zombie, colonial exploitation, voodoo ritual, and exoticism (geographic, racial, colonial, and sexual). From the mid-1930s the zombie film expressed fears of fascism that followed shifts in the geo-strategic interests of the democratic West. Yet in the 1950s the zombie retreated back into the grave. At least for American audiences, this period bore minimal fears about the domestic economy. Instead, horror films revolved around existential threats of alien and soulless collectives from outer space, reflecting geopolitical fears of the Red Menace (see Zombies of the Stratosphere, 1952). The ‘consuming ghoul’ that defined the ‘Golden Era’ of zombie-films (1968-1983) expressed different social pathologies. They no longer made the highly personalised attacks of the labouring zombie, but instead were “pure, motorised instinct” (Night of the Living Dead, 1968; Dawn of the Dead, 1978). The slow but indefatigable advance, en masse, of George Romero’s ghoul’s had a “sociological purpose behind it” – what Koven has described as an attack on “the sins of modernity” – by a ravenous horde with one instinct: the compulsion to consume. What elicits fear is not slavery to a master but the potential reversal of this process: of being made the subject of consumption by another, and, more subtly, the fear of not being able to compete effectively against others in the market. This zombie is a mirror held to Western consumerism as it preys upon peripheral economies. They are no longer possessed or undead but retain only some frantic desire to consume – the costs of the West’s rate of consumption turned against itself. The choice for survivors is between being ripped open and consumed, or being made like one of them. The latter is perhaps the more dreaded outcome, suffering all the ignominies and inequities of being placed in the Periphery – a place where you can only mill aimlessly outside shopping malls full of goods that you once produced but can no longer access (Dawn of the Dead, 1978). The consuming ghoul reminds us that the sickness of violence committed to people in the Periphery has now infected the Core. It is well known that global inequality is rising within countries – and Australia has one of the fastest growing rates. The emergence of Dark Factories across many states within the Core is a stark reminder of how people can, at any moment, have the ladder kicked away beneath them and fall into the ranks of the zombie horde. The ‘quick zombie’ of contemporary cinema – beginning with 28 Days Later – is the intensification of such appropriation and consumptive patterns. Robin Wood once observed the zombie movie merely carries “to its logical conclusion the basic (though unstated) tenet of capitalism, that people have the right to live off other people.” The quick zombie is the acceleration of humanity toward the precipice of social and environmental destruction. The non-reflexivity of the maximising consumer is replaced with a frenzied rage that cannot be reasoned with or redirected – like crazed shoppers during Black Friday sales. The survivors of today’s cinema show a peculiar lack of sociality and their solutions are rarely cooperative joint ventures. One simply needs to tune into the popular TV series The Walking Dead to see how quickly the human survivors become a greater threat to each other than the zombies themselves. Most of these stories fortify the belief in atomisation, that the lone man – and always a man – like Gerry Lane in the film adaptation of World War Z (2013), is all that can be relied on for survival. There is no social world to turn to because it has been consumed. We truly have been duppyed. So, if international political economy is about who gets to consume and why, and if Robin Wood is correct in his claim that the role of all monsters in horror films is the ‘return of the repressed’, then what is the zombie trying to tell us? Quite simply, that the erosion of social life and the repression of our communal instincts is playing havoc in our subconscious. We fear and loathe alienation. In terms of world politics, the zombie is beckoning us to revivify our social relations as the only way to resist zombification. Turn back to global civil society before it is too late. Note: For the full article please refer to: Roxanne Chaitowitz, Shannon Brincat (2018), “’Warning! Zombies Ahead’: An allegory of absolute negation under predatory capitalism,” in R. Saunders, V. Strukov (Eds. ), Popular Culture and Geopolitics, London: Routledge. Shannon Brincat is a Senior Lecturer in Politics and International Relations at the University of the Sunshine Coast, Australia.He is the co-founder and co-editor of the journal Global Discourse and helps run Queensland Philosophy. Roxanne Chaitowitz works at the Brotherhood of St Laurence, Melbourne, Australia as a research and project coordinator for youth unemployment. She is a former PhD candidate at the University of Queensland where her thesis looked at the value relational practices can disclose to our analyses of the experiences, struggles, and challenges of being homeless.